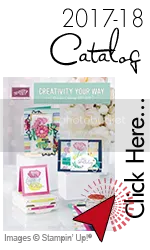 I’ve got a fun Scrapbook layout to share with you using lots of free Sale-A-Bration product – the Sycamore Street Bundle – which include the Madison Avenue stamp set, Sycamore Street Designer Paper and Ribbon and Button bundle – these were all free for $400+ workshop hostesses. Plus the Vine street embossing folder. This layout was one that we made in my February Scrapbook class. It’s a layout that’s all ready for some fun photos! I’ve been behind with sharing scrapbook layouts so I’ll try to catch up on that this week. This morning I had a fun class as we made two new layouts. 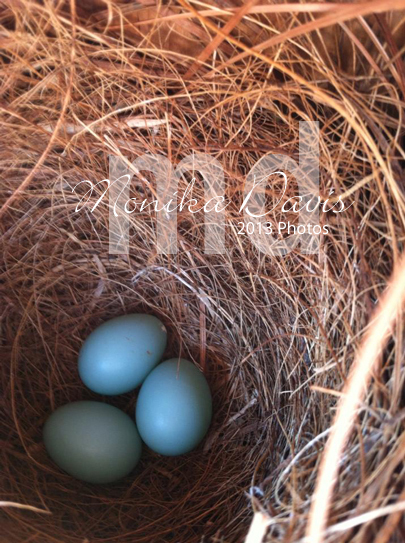 I have had a lot of people ask how am I getting these pictures and where is the nest. The nest is inside a bird house in my backyard. The front of the house opens so I wait until the birds leave and then I open it to look inside. I have been using my iphone to take these pictures – I just stick it inside and click. Then I close up the house and mom and dad come back. 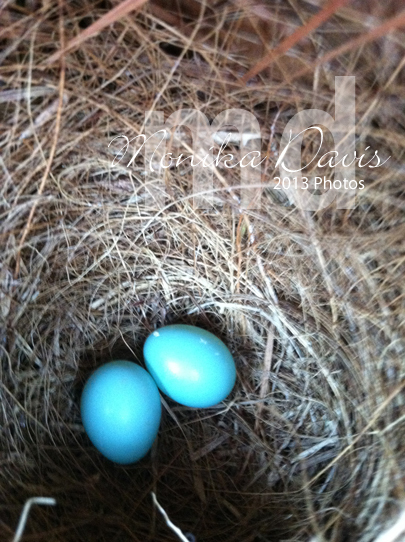 Now though she will be incubating the eggs and won’t be leaving the nest much. Today I noticed both the male and female in the yard most of the day – they sat on my porch and on the feeders a lot today (the feeders were empty so I filled them this afternoon). The incubation is 12-14 days – so now we start counting – today is day 1. 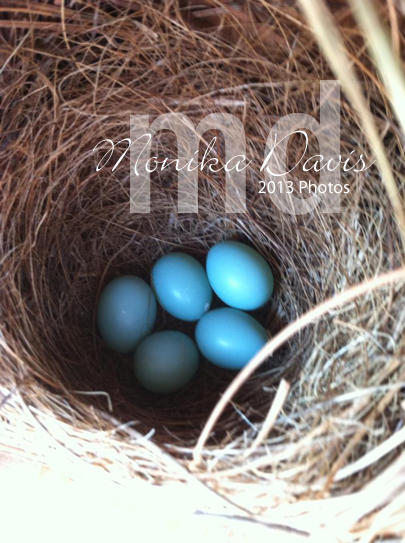 So we should have babies hatching around April 2-4. Once they hatch I’ll get more time to peek in again as mom and dad will spend most of the day getting food for those babies. I’ll keep you posted. Posted in Big Shot, Designer Series Paper, Sale-A-Bration 2013, Scrapbook Pages	| Tagged Big Shot, Monika Davis, Scrapbook, Spring 2013 Catalog, Stampin' Up! Here is one more quick card using the Madison Avenue stamp set and a few other Sale-A-Bration items. The Sycamore Street Designer Series paper was used along with the coordinating Madison Avenue stamp set and Vine Street Embossing folder. This is a 4-1/4″ square card. I used this card as an example during some new demonstrator training sessions. This would be easy to change to use the products you have on hand. 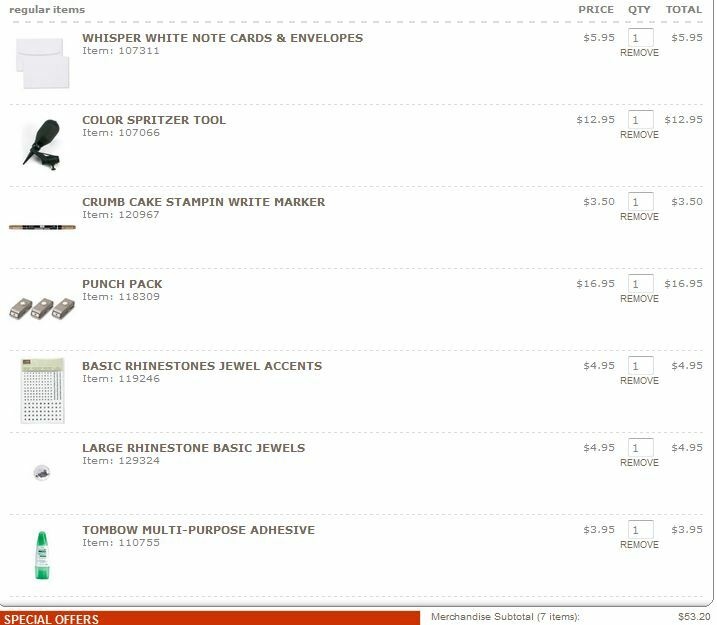 The base used here is Shimmery White card stock – but you can just as easily use Whisper White. You could use a different embossing folder or not emboss it all. Switch out the ribbon – the Sycamore Street ribbon would have worked here too. The Fabulous Phrases stamp set that I used here has a ton of different words to choose from – but if you don’t have that one choose something you do have. The stamped flowers were embossed with clear embossing powder and the heat tool – but you could stamp with just VersaMark ink or use the same color as the card stock. Switch out the designer series paper – and then use matching card stock. There are so many different ways to alter this little card you could have a whole stack and each one be different. Let’s see if she adds another one tomorrow! Posted in Big Shot, Cards, Sale-A-Bration 2013, Thank You, Wildlife	| Tagged birds, Monika Davis, Sale-a-Bration, Stampin' Up! 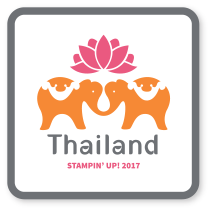 Stampin’ Up!s biggest promotion of the year – Sale-A-Bration – is nearing the end! Don’t miss out on a chance to get free product – exclusive Sale-A-Bration items or select items from the regular catalog. Yes – did you know you can select from some regular catalog product too – including the Simply Scored Diagonal Plate! Sale-A-Bration ends on March 22nd. And here is a special offer for you – if you’d like the chance to earn free hostess dollars too – then place an order online through my website by March 21st using the Hostess Code XR62ZECB. I’ll draw for the hostess rewards from everyone that orders – that’s 3 people ordering $50 each – then you each get a free Sale-A-Bration item and a chance to win the Hostess benefits. Here is a card using the Bloomin’ Marvelous stamp set – it’s one of the Sale-A-Bration exclusive sets and has a gorgeous font on the phrases plus flowers and a hummingbird in the set. It’s a Peek-a-boo style card and I got this idea from Dawn Olchefske. Thanks Dawn for this beautiful card idea. I pretty much used her card exactly. No need to change something that was so pretty to begin with. It’s pretty amazing. This picture isn’t that great – it is with my iPhone and it was starting to rain when I snuck out to take a peek. I checked earlier before the rain but no second egg – so this picture was taken within 3 or so hours of when she laid it. Tomorrow I’ll see if there is another one – it should be one a day until she is done – usually with 4 or 5. 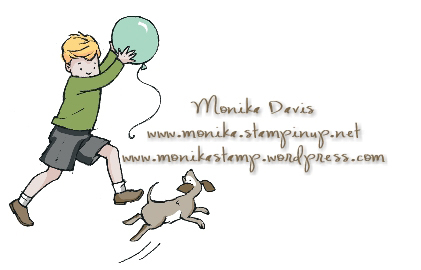 You may also want to follow my on Facebook – Stampin’ Up! 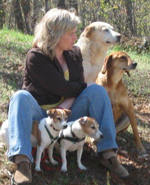 has lots of specials and news coming out each week and I can get it out faster on my FB page than here on my blog – plus you may see some projects and other things on there that I’m not posting here. I tried to add a link plus you can go to the right side-bar on my my blog and like my page then be sure to add it to your news feed so you can see as soon as something is updated. This morning a big My Digital Studio announcement – what was MDS2+ is now going to be MDS and will be $19.95 – now there is no reason to keep putting off getting this product. Read more about it on Mydigitalstudio.net (you can get there through my FB page too). Posted in Cards, Sale-A-Bration 2013, Wildlife	| Tagged birds, Monika Davis, Sale-a-Bration, Stampin' Up! This is an easy Desktop Calendar project that I made earlier this year. 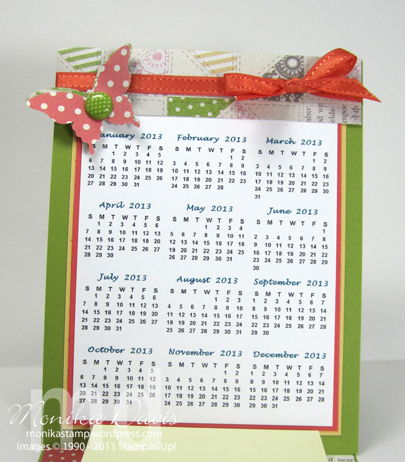 My Digital Studio makes it easy to create the 12 month calendar to print at home. After creating the calender in My Digital Studio – I printed it on Whisper White card stock and trimmed it down. Then layered it on Calypso Coral and So Saffron card stock. And then to a 5-1/2 x 4-1/4 piece of Lucky Limeade card stock. I decorated the top with a piece of Tea for two designer paper, some Calypso Coral ribbon from the Sycamore Street Ribbon and Button pack from Sale-A-Bration. And finished it with some punched butterflies and a Lucky Limeade brad. The base of the calendar is a normal size card – 11″ x 4-1/4″ scored at 5-1/2″ and then score a second time on one side at 2-3/4 – this creates the mountain fold that you attach the calendar too. On the bottom of the card I added a piece of Tea for Two designer series paper and then the stack of Post it Notes. The great thing about the size of this calendar is that you can fold it flat and it fits in the medium envelope. Well if your stack of post it notes is really thick it might not fit. Sale-A-Brate with Madison Avenue Again! 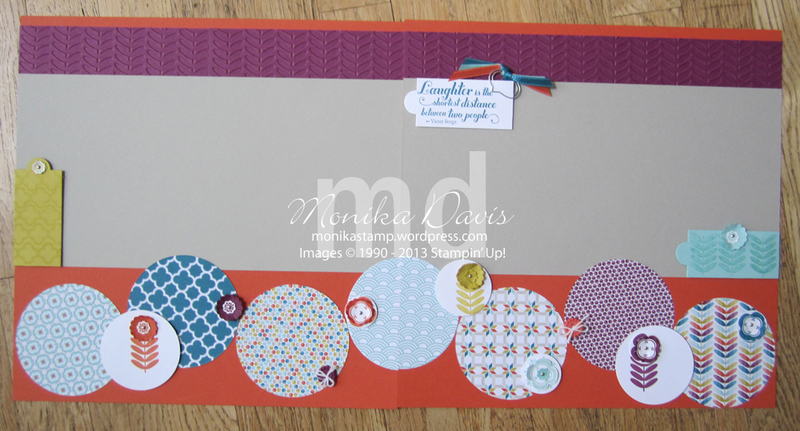 Here is another idea with the Madison Avenue stamp set from the Stampin’ Up! Sale-A-Bration brochure. I saw this idea on a blog from a demonstrator that lives in Germany. She has such a unique style that I really love. I thought this was a totally different look and way to use the Madison Avenue stamp set. The flower image is stamped twice in each color. Cut them out – one is the full flower and the other is the inside portion of the flower. Then curl them just a bit on the ends and glue them together. Add one of the new large Rhinestones in the center. This is one of the little note cards – the come in a pack of 20 with matching envelopes. A little bit smaller than the size card I usually make. I spritzed the card and envelope with a Sahara Sand Stampin’ Write marker and the Color Spritzer. I added the stamped flowers and then punched some little flowers using the Itty Bitty Punch pack. Add small rhinestones in the center of those. 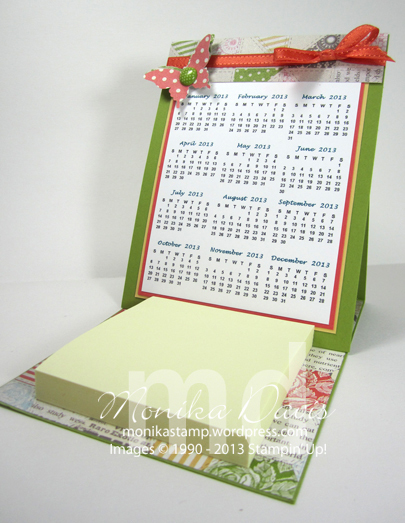 You can order at my website www.monika.stampinup.net – click on Shop Now. Another Sale-A-Bration card to share with you – this one uses the Bloomin’ Marvelous stamp set and the Vine Street Textured Embossing Folder along with a hint of the Sycamore Street Designer paper and ribbon. Pool Party for the card base. Emboss with the Vine Street Embossing folder – just 3 of the vines. final touch is a bitty button tied with some Whisper White Baker’s Twine. Posted in Big Shot, Cards, Sale-A-Bration 2013	| Tagged Big Shot, Monika Davis, Sale-a-Bration, Stampin' Up! Did you know you can make your stamps go a little bit further by using the Omitting Technique? Maybe you haven’t even heard of this. Well on this quick card that we saw at the Stampin’ Up! 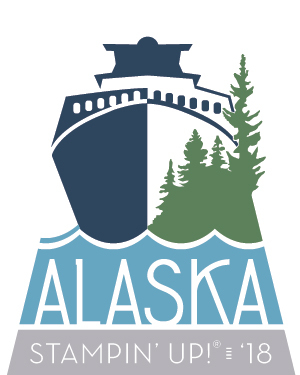 Leadership conference that is exactly what you’ll see. The Omitting Technique is basically where you omit a portion of the stamp image by not putting any ink on it. 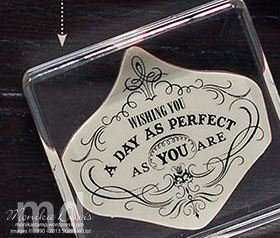 The easiest way to do that is to use your Stampin’ Write Marker’s. On this card the stamp image from the Vintage Verses stamp set has the detailed frame with words in the center. Using the marker apply ink only to the frame and not the words, give it a little “huff” to make sure its all still moist and then stamp it on your paper. The card base is one of the Note Cards from the Note Cards & Envelopes in the main catalog – these are white and come with 20 cards and envelopes in each pack. They are 5″ x 3-1/2″ note cards with envelopes to fit. Ink up the stamp with the Cherry Cobbler Stampin’ Write Marker applying ink only to the frame (“Omitting Technique”) and stamp on the front of the note card. Ink up the Thanks stamp with Jet Black StazOn ink and stamp over the frame. 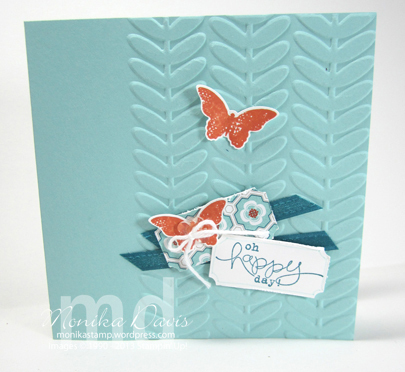 Punch two butterflies from Vellum Card stock using the Elegant Butterfly stamp. Stick them together with a glue dot and add to the front of the note card with another glue dot. Add a Rhinestone to the center (it cover’s the glue dot). Tie a piece of Whisper White Baker’s Twine around the spine of the card. That’s $52.70 – which is enough to get the Vintage Versus set for free – you can make 20 note cards. You’ll have plenty of everything else left – so buy an extra pack of note cards and you have 20 more. And you’ll still have enough of everything left to make lots more. 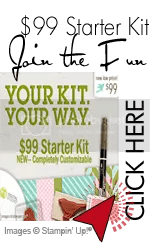 If you would like to order any of these products just visit my website any time – www.monika.stampinup.net – click on SHOP NOW and have fun!